Now for the big kids, too! Here at Sandos Caracol Eco Resort, we’re all very excited about the recent opening of the new extension to our Aqua Park. Those of us who have already visited us will remember that before we had a water park exclusively for little kids, with colorful water slides and large splash areas. However, we came to the conclusion that we needed to offer the same fun to the “big kids” staying at our resort. On February 7, 2016, we opened a new area to the Aqua Park with a total of 12 new water slides designed for adults, teens and kids. Ever since opening day, the Aqua Park has become one of the most popular attractions for the people staying at Sandos Caracol! Of course, a Playa del Carmen vacation wouldn’t be complete without some fun in the water, and now our guests can enjoy all kinds of water slides (including classics like the Kamikaze) in addition to our beautiful pools and water sports on the Caribbean Sea. Now the Aqua Park has three areas: the Aqua Park for little kids with lots of mini slides, a kids’ area with 5 water slides, and an area for adults and teens with 7 water slides. What are the height requirements for the new water slides? 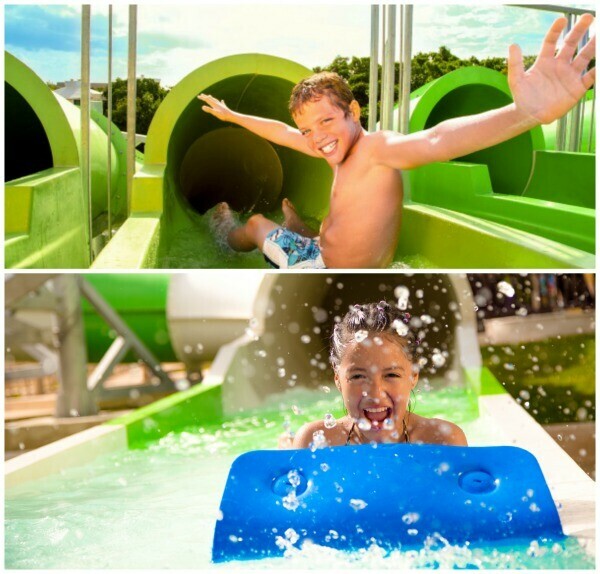 For your safety, use of the water slides is based on height, no matter what your age. The new water slides for kids require a minimum height of 1.10 meters (3 feet 7 inches), and the new water slides for teens and adults require a minimum height of 1.40 meters (4 feet 7 inches). The littlest guests will find a world of fun in the kids’ Aqua Park with mini slides and so much more, always bringing an adult to supervise. Yes! All guests staying at Sandos Caracol Eco Resort have access to the Aqua Park at no extra cost. When is the Aqua Park open? The kids’ Aqua Park area is open daily from 9:00 am to 6:00 pm. The water slide area is open daily from 10:00 am to 5:00 pm. The construction of the new Aqua Park didn’t affect any of the jungle or mangrove areas of the resort. The new water slide area was built was a completely clean area, and the few palm trees that originally stood there were moved to other parts of the property. Sandos Caracol Eco Resort is committed to environmental preservation and minimizing our carbon footprint. We always strive to offer sustainable vacations to our guests! 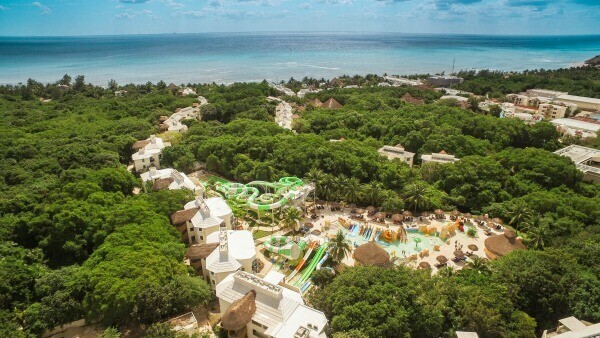 In addition to the extensive water park, Sandos Caracol also offers eco activities for families and couples every day. Visit us to discover Mayan legends and the natural beauty of the Riviera Maya through the interactive activities in our Xcalacoco Experience. We hope to see you soon for an all inclusive eco vacation in Playa del Carmen! Visit us at Sandos.com to book your stay and see our new Aqua Park. What Clothes Should I Pack for My Sandos Vacation? Hello, we will be visiting the ECO Caracol resort in August. What is the typical weather near the end of August? Do the waterparks remain open even if it is raining? For shopping in the city, is Playa De Carmen nearby? Can you walk to it, if not any shuttles available and how much? We enjoy really spicy pepper food, are we going to be happy with what is available at the resort. We enjoy REALLY spicy food, should we maybe bring some of our own pepper sauce? Yes, for safety reasons, we close the water park as soon as we see raindrops. We sometimes close it earlier if there’s a chance of a tropical storm. Sandos Caracol is right outside of Playa del Carmen, but the main shopping area on 5th Avenue is not walking distance from the hotel. You can take a taxi straight from the lobby, and it’s about a 10-15 minute taxi ride. We do have salsas at the resort, but maybe bring your favorite super-spicy sauce just to be safe! Hello, We are planning a visit in April with our children and grandchildren. Do you have an age restriction for children in the main pool with the swim-up bar? Can babies go in any of the pools? Also do you have transportation to and from the airport. So very excited to come, just want to be sure everyone is able to have a good time together. Thank you. Hi Tami! There is no age restriction in any part of the main pool at Caracol. There is a shallow area especially for babies and toddlers at the opposite end from the swim-up bar, but kids of all ages are welcome in any part of the pool. We do not include airport transportation, but we can help you book it! Just send us an e-mail at [email protected] with your information. See you in a few weeks! We just booked for March 18. Generally how is the weather . Was wondering if there are Easter activities before hand for the kids. I have done some brief browsing on activities and am very excited for my son to experience everything. Do the animal keeper spots fill up quick. Does everyone get a chance. Anywhere you suggest to look further into thing? Good morning Marc! Weather in March in Playa del Carmen is usually very warm (usually 80 – 95 degrees Fahrenheit) with very little rain. For Easter activities, here is a blog post we wrote last year on some of our activities. This year will most likely be similar: Easter egg hunts, crafts, etc http://blog.sandos.com/en/celebrating-easter-at-sandos/ However, these activities usually happen on Easter Day, so your stay will be a bit too early. For Animal Keeper, so long as you stop by the InfoCenter (just outside the Sports Bar) in advance to reserve a spot, you shouldn’t have a problem. Try stopping by the InfoCenter on the day you arrive to ask about availability! See you guys in a few weeks! Can you tell me on the larger slides are kids who may be under the height requirement allowed to go on the slide with an adult? Hi Crystal! Sorry, if they do not meet the height requirement, they cannot use the water slides, not even with an adult. We will arrive on 15 April. Can’t wait! Does the hotel do anything special for the kids on Easter?? Bit rarly for us but we have booked a family holiday for Oct 2018 grandparents, daughter, son in law and grandaughter from Scotland . Resort looks amazing and our granddaughter will be just over . Im a sunworshiper is there enough areas to accommodate the 956 rooms? Hi Lynn! Great question, here at Sandos Caracol we have plenty of sun loungers for all of our guests. I’d recommend getting to the pool or beach around 9am to ensure you get your favorite spot, but either way you shouldn’t have any problems finding somewhere to enjoy the sun! I was wondering if there are any bathing suit restrictions for the waterslides. Are kids allowed to wear sun shirts with long sleeves to go on the slides? Also can ladies wear some sort of swim dress like a swim suit/skirt? we have been to other waterparks wear they did not allow these bathing suits. Hi Mike! Good question. The only swimsuit restrictions at the water park are the following: Bathing suit is required for slides and pool, no denim or cut-off shorts or underwear, children under 3 years old must wear a swim diaper. So long as your family is wearing a swimsuit, the style doesn’t matter. Have fun! I am wanting to travel to your resort Sandos Caracol, but have a young toddler with food allergies. Do yall make accommodations to accommodate him so he can eat the same food as my other 3 children? Hi Melanie, thanks for your question. Yes, we can accommodate special dietary needs. Upon your arrival, please let our concierge know your requirements so they can print them out for you. When you arrive at our restaurants, just show this print-out to your waiter and he/she will make sure your food fits your needs or they will have a special dish prepared. See you soon! What is the maximum height for the little kids water park? The water park with the smaller slides that already existed. Hi Amy! The little kids’ water park has no height limit, only an age limit: maximum 12 years old. Have fun and we’ll see you soon! Do you sell day passes to customers NOT staying at a Sandos resort? If so, what are the prices? How convenient is the hotel to the Ferry Station in Playa del Carmen? We are traveling to Cozumel in April and am wondering if this would be a good day trip option. Does the $1850 day pass include access to all inclusive food/restaurants? In another post you wrote that the price is $1220…which is correct? What will the price be next March? We have a Royal Elite package through you but we were not able to book there this year as it was full for our needed travel dates. Are we able to buy day passes to the water park so we can bring our kids? If so, how much would it be? We’d be 2 adults, 2 kids (5 and 2 years old). Hi Cheryl, I just saw your comment and passed it along to Royal Elite. They will be in touch shortly. Thank you! hola, quisiera saber si me hospedo en otro hotel que no es Sandos, puedo visitar con mi familia el aquapark de l Sandos Caracol? Cuál es el costo? Hay que avisar con tiempo? Buenos días Javier, hasta hora no tenemos nada programado. Do you have connecting rooms ? Yes, Sandy! At Sandos Caracol some of our Standard and Deluxe rooms connect, as well as our Royal Elite One Bedroom and Royal Elite Superior rooms (for Royal Elite guests only). Please keep in mind that connecting rooms are subject to availability; you can make a note requesting connecting rooms when booking your stay, but they are not guaranteed. I will be Coming next month to coracol eco, cant wait to be there, looking forward being your guest. See you in a few weeks!! Look forward to having you. Hello, my family (5) kids will be visiting the Sandi’s Caracol in Feb 2017. We have an all inclusive package and we were wondering if snorkeling equipment was provided for use in the package. Thank you! Hello, is it a far walk from the rooms or water park, to the beach. When staying at Caracol? Hi Lisa! The rooms are distributed in villas throughout the property, so it really depends on where your room is located; that being said, it shouldn’t be more than a 5-minute walk to get to the beach or water park from any of the rooms. Can Caracol guests go to Playacar to see the Michael Jackson show and use their facilities? If so is there a cost? And how far are these resorts from one another? Yes you can! Sandos Playacar is approximately 15 minutes south of Sandos Caracol. There is no cost to use the facilities at Sandos Playacar, although we do not provide transportation. Hi am Planning my 60th birthday at rivera maya at Sandos Hotel can you tell me if all your sandos Hotel have access to the waterpark, Coming next year 2017 with family 3 kids small and big So need to know before I book if all the Sandos can access the Waterpark. Thank you. The water park is located at Sandos Caracol Eco Resort, so of course guests there have access. If you are staying at the nearby Sandos Playacar Beach Rsort, you also have free access to the water park; just make sure to let the reception desk at Sandos Playacar know that you will be visiting the other resort. Si me hospedo en sandos playacar puedo utilizar piscinas y bufete del sandos Caracol y sandos Cancún? Para Sandos Caracol sí, pero en Sandos Cancún tendría que pagar un daypass. Si piensa visitar Sandos Caracol, favor de avisar a recepción en Sandos Playacar antes de ir. ¡Saludos! Is it possible to visit you resort on a day pass and enjoy the water park? Hi Chris, right now a day pass costs $1220 pesos for adults (roughly $60 US dollars, depending on the current exchange rate). Kids 12 and under pay half. Hope to see you soon! we are coming 2 adults and a child, for the first time, begining of august from Belgium ! can´t wait to discover your resort and the water park . We can’t wait to welcome you! See you in less than 3 months! Sandos Caracol has bug repellent available at posts scattered throughout the resort. There are not too many mosquitos, except maybe a few around sunset time. That being said, our state of Quintana Roo has had zero cases of Zika reported thus far. Hello could you tell me if your new water park is open to the public or for privet use of the resorts guests. Thank you. Hi Tammra! The new water park is for Sandos hotel guests only. If you are staying at the nearby Sandos Playacar or even at Sandos Cancun, you can also have free access to the water park at Sandos Caracol. Si te hospedas en Santos Playacar, algún día se puede ir a visitar el Agua Park de Saldos Caracol? Hola Pablo. Sí, los huéspedes en Sandos Playacar pueden visitar Sandos Caracol sin costo. Nada más hay que avisar a Recepción que van a visitar el otro hotel. ¡Saludos! Si me hospedó en el sandos playacar también tengo acceso al parque acuático? ¡Hola Sebastián! Sí, los huéspedes en Sandos Playacar pueden visitar Sandos Caracol sin costo. Nada más hay que avisar a Recepción que van a visitar el otro hotel. ¡Saludos! There are 2 families returning in August from the UK. Can’t wait to host you! Safe travels and we’ll see you soon.